Hope Works’ brand new festival No Bounds launches on June 9th. 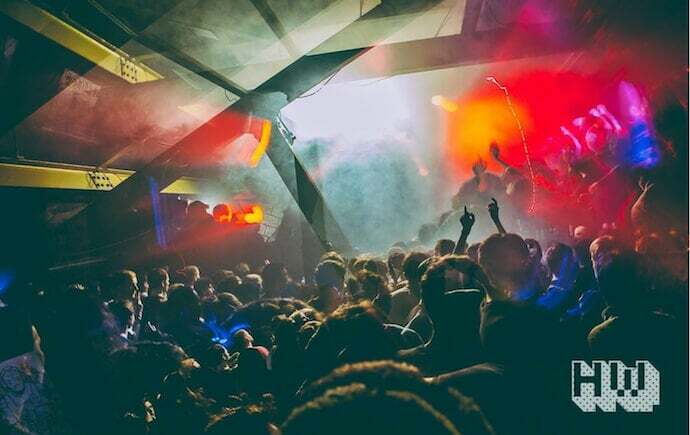 A whole 18 hours of art, music and technology workshops with the likes of Nina Kraviz and Helena Hauff headlining two simultaneous night raves, the extravaganza is a one of a kind event for Sheffield – and the UK – and a must see for all technophiles. Our Nightlife Editor Leo Burrell caught up with HW owner Liam O’Shea (AKA Lo Shea) ahead of the launch to find out more. It’s a special time for Hope Works, with the No Bounds festival launch coming up and another cracking year of parties under the belt. What’s next? Yeah, so No Bounds and then our off-Tramlines parties. We’re doing a big old school rave-up with Special Request, Altern8 Live and Nebula 2 on the Friday and then Willow on the Saturday with a load of Sheffield DJs, sort of like our New Year’s Eve parties. And then there’s the Autumn season, when the full No Bounds weekend festival will happen. So the June event is only the start of something bigger? There’s so much going on on June 9, I can’t imagine what you’ve got planned for October! I’ll tell you more on that soon. Suffice to say, June is a taster of what’s to come. We’re gonna follow this theme, expand upon it and make it much bigger. What are the aims for No Bounds, and how does it fit in with the Hope Works club and label? It touches on a couple of things. It’s gonna have music, art, technology and dancing. It’s not just a music festival: there are different strands to it. As in the name itself, it’s attempting to push boundaries,and fundamentally more experimental. Its aims are to do interesting things in innovative ways. It looks to celebrate Sheffield but it isn’t insular; we’re joining an international conversation that is already going on, not reinventing the wheel. Ultimately it’s coming from my own general interest, from the sort of events that have impressed me and not just music. I’ve noticed that there’s a ton of female artists, DJs and live coders on the line up. There’s actually more women than men, which is quite the achievement considering so many line-ups fail to have more than 3 women let alone a majority. Was this something you aimed to do with No Bounds or did it happen by accident? I’m always looking to encourage gender parity, but it was a mixture of that and the fact that lots of the things I like at this time are being made by women. If it can inspire women to move beyond existing frameworks and limitations that exist in society then great – there are many areas that can be highlighted and explored like this, and hopefully we can do that over time. It looks incredible, too! 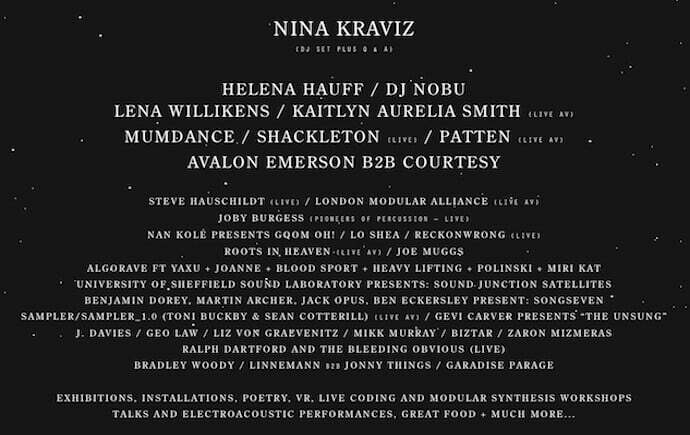 There’s Nina Kraviz, Helena Hauff, Lena Willikens and Kaitlyn Aurelia Smith’s Live AV set! As I say, the things these artists are doing are all incredible. Nina’s obviously a huge star, I’ve had her at Hope Works before and she’s someone I really respect as an artist and a label owner. Shes does what she does with such integrity. Then Lena’s an unbelievable selector, as is Helena, they’re killer. And they’re both really coming into their own, with Helena’s Essential Mix and Radio 1 residency. And Kaitlyn, with a critically-acclaimed album under her belt. The avant-garde stuff she’s doing with the Buchla Music Easel is such an inspiring thing, and it really caught my mind at the end of last year. She’s just an electronic artist that came out of the ether. There’s loads more I’d like to book, so this feels like just the start. I think it’s important for people to know there’s a whole host of female artists out there doing amazing things. Doing No Bounds means we can balance the knowns with the unknowns. You’ve said No Bounds is about moving beyond boundaries – change, growth and progress. What other stereotypes and boundaries are you hoping to break down? It’s not about offering solutions so much, it’s more about asking questions and encouraging dialogue instead of offering advice. I’m hoping that by the way things are programmed, we’re gonna reach out to people who think in certain ways, bring them together and expose them to a lot of things. There’s an awful amount of stigma still attached to dance music and “repetitive beats”, to paraphrase Thatcher. The reopening of Fabric this year was certainly a victory against that, sp do you see No Bounds as the next frontier? We’re joining in the movement and conversation that’s already going on with other people, like-minded individuals and other festivals that exist that explore art and technology. And letting Sheffield be the place to do that, shining out as a a city. It’s not the easiest place to do it, but I wanted to try! It depends who you’re asking, but I think it’s interesting to be at an event that doesn’t just cater to one train of thought. Some events function as just somewhere to get off your face, but this hopes to be much more than that. There are so many DJs, live sets and bands on the bill: DJ Nobu, Mumdance, Shackleton (Live) and Avalon Emerson b2b Courtesy to mention just a few. But that’s only half the party! Do you want to run us through the other side of things? There’s gonna be exhibitions, installations, workshops, talks, electro-acoustic performances. It ranges many of different forms of art, from spoken word with Ralph Dartford and the Bleeding Obvious to Genevieve Carver presents The Unsung. Then there are a lot of crossover performances too, with Benjamin Dorey’s acoustic group, Song Seven with Martin Archer, who’s a big leader of free improvisation scene in Sheffield. We also have the first pop up VR and Poetry exhibition in collaboration with Epiphany VR Genevieve Carver and Wordlife. I’m extremely proud to say we’ve managed to get a 1 hour Q&A with Nina Kraviz and Joe Muggs of Mixmag; it’s gonna be a great opportunity to hear what she’s done and it’ something she never really does. She’s really behind what I’m doing with No Bounds, which I obviously massively appreciate. 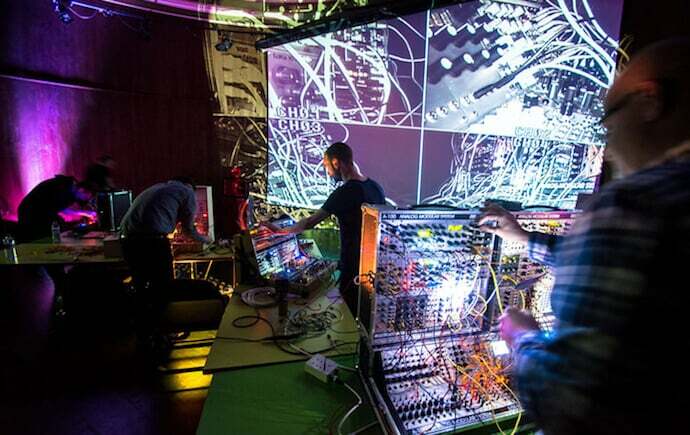 And then there’s live coding, modular synthesis workshops with Mumdance and London Modular Alliance, the London shop and group. They provide a lot of modular gear to a lot of artists in the UK. It’s gonna be a really interesting thing to watch, it’s a specially made live A/V performance. 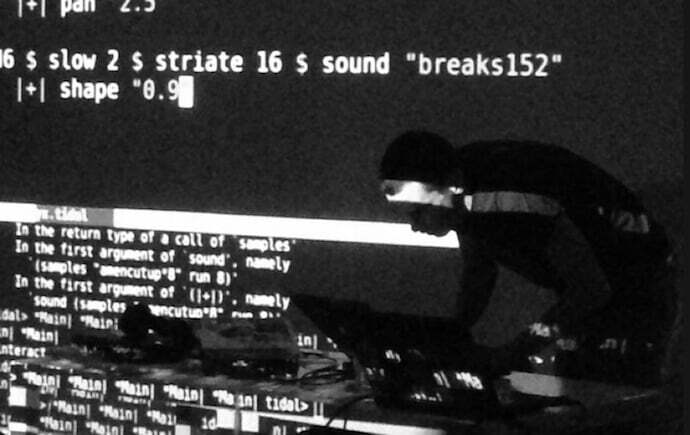 Alex McLean, a driving force behind the Algorave movement, is doing the open coding session. It’s pattern-based music, made on the fly. It feels kinda punk to me. There’s someone typing in streams of code in front of your face, projected onto the wall behind them, while the music changes as it’s being done. It’s a really interesting way of making music, especially to younger people. And this is happening over two venues, for 18 hours?! What a marathon! Will there be food and drink stalls to keep us going? Yeah we’ve got Foodhall doing a pay-as-you-feel pop-up stall of quality vegetarian cooking and a couple more different food vendors yet to be announced. The whole itinerary is on the website, there’s always gonna be something happening. The daytime event is at Trafalgar Warehouse across all 3 floors, with music happening on one floor while another has a workshop and so on. There’s going to be a showing of a film by Bradley Woody, a photographer and filmmaker from Sheffield, with music by Gabriel Gurnsey of Factory Floor. The daytime event is 14+. Are you aiming for this to be a family-orientated experience, or more for teenagers with nowt to do? Getting young people interested in electronic music from an earlier age is definitely something that should be happening, it seems to happen so early on for the youngsters in Detroit etc, but the music education system in the UK is so dated. Yeah, it’s going to be little more family-friendly. It was important to me to give access and opportunity for younger minds to see these things. There’s two late-night raves happening simultaneously at Hope Works and Trafalgar Warehouse after – and a free shuttle bus between the two! There isn’t, certainly not in the north. And there are plenty in the rest of Europe, like Unsound in Krakow or CTM and Atonal in Berlin. It’s part of a conversation we’re joining in with. It’s mostly with people I’ve come into contact with in the industry and it’s been well-received. The No Bounds launch party hits Hope Works and Trafalgar Warehouse on June 9th. For tickets and more information head here. All Hope Works photos credited to Alex Morgan.